↑ Stewart, Desmond. Pyramids and the Sphinx. [S.l. ]: Newsweek, U.S., 72. Print. Clay, Jenny Strauss, Hesiod's Cosmos, Cambridge University Press, 2003. আইএসবিএন ৯৭৮-০-৫২১-৮২৩৯২-০. Dessenne, André. 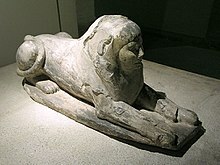 Le Sphinx: Étude iconographique (in French). De Boccard, 1957.